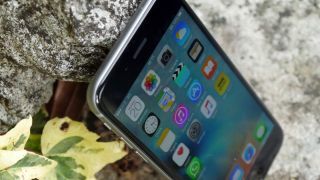 Apple is expected to make big changes to the iPhone for the 2017 model, to mark the tenth anniversary of the phone - and rumors are one of those could be an iris scanner, just like Samsung has started doing. Eyeball scanning, of course, is a big new feature for the Samsung Galaxy Note 7 (although it's been around for longer than that on phones like the Lumia 950), and may well be coming to the Samsung Galaxy S8 as well, so if the iPhone 8 has an iris scanner too the tech will officially have gone mainstream. The theory that the iPhone 8 (or iPhone 7S if Apple's nomenclature holds up) will scan your eyes is based on a Chinese-language report, picked up by Digitimes, stating that according to "market watchers" a company called Xintec is to start mass producing iris-recognition chips, some of which will apparently be used in the 2017 iPhone. Digitimes is hit and miss for rumors, so we'd take this with a big helping of salt for now. In some ways it would make sense for Apple to put an iris scanner in the iPhone 8, as it would allow the company to compete more directly with Samsung. But there's a question over how useful an iris scanner actually is for the average smartphone owner, and Apple doesn't tend to roll out features that aren't ready for mass adoption, and it would need to be much faster at recognising your eyeballs - current versions are just far too slow to be useful. If the iPhone 8 does have an iris scanner that might not be the only way in which it mimics Samsung's phones, as earlier this year we heard talk of a curved AMOLED display, which sounds a lot like what we've seen on the Galaxy S7 Edge and Note 7.